Japanese Episode AG 147: "Psychic vs. Ghost! The Midnight Duel!?" American Episode 417: "Fear Factor Phony"
While on their way through the Battle Frontier, Satoshi and his friends come across a ghost town. The young trainers are all afraid of the deserted borough, but an incoming storm forces them to put aside their fears and stay the night. As they look for shelter, they come across an abandoned mine, but a giant ghost scares them away. As they continue their search for shelter, Musashi-tachi stumble across the mine and discover that the ghost that had scared Satoshi and his friends away was just an illusion! They find out that a group of ghost-type pokemon had created the apparition to ward off a group of psychic pokemon. These pokemon, who had been abandoned by their trainers after the mine became inactive, keep the ghost pokemon up all night with their constant partying. Therefore, a rivalry had broken out between the town's ghost-type pokemon and its psychic-type pokemon. 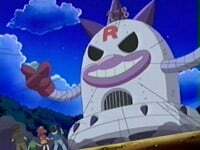 The Rocket-Dan team up with the ghost-types and have them create their chimera to disguise one of their mechas. As they try to steal all the psychic-type pokemon, Satoshi and his friends arrive to thwart their plans. After a brief battle, the Rocket-Dan is sent blasting off again. However, the feud between the two pokemon groups continues! At that time, Takeshi notices that a Cayce had been using Safeguard as a barrier to block the sound of the fighting around it, so he has the pokemon use the technique to enclose the psychic-type pokemon's partying. In this way, the psychic-type pokemon can still party without disturbing the ghost-type pokemon. Now that the storm has subsided and the two groups have stopped fighting, Satoshi and his friends can continue their journey to the Battle Arena. Going into the first episode of a new season is always exciting because it's the point when change, if any, is going to take place. Not knowing whether the upcoming change is for the better or for worse creates a sort of excitement that can't be replicated by any other episode in the season. Even though the idea of judging an entire season based on one episode is beyond retarded, people do it anyway. I guess we're all lazy that way. This season's first episode is extra special in that it's the first episode to be dubbed after the big dubbing switch. After Pokémon USA obtained the rights to the series, fans were in an uproar. Notice how I used "obtained" instead of something more forceful sounding like "took" ; the latter invokes images of a tall, shadowy figure in a trench coat snatching candy out of the hands of a crying baby, but I don't really think we should look at it that way. It's obvious that after months of he-said-she-said, we fans seem to know the least about what went on behind the scenes of the two companies, so I think it's best to ignore all these dubbing politics and focus on what we have; a show being dubbed by a new company who's trying to live up to fans' high expectations. The big change here is the change in voice actors. For what it's worth, I think the only two voices that really need work are Ash's and Meowth's. Ash sounds like a character-of-the-day, but I also realize that this wasn't really a really Ash-heavy episode. I mean, what did the character do in this episode that allowed Sarah Natochenny the chance to show off? We won't get one of those for a few episodes, so I don't expect to see any improvement until after then. The other voice that sticks out to me is Meowth, who is now apparently voiced by a Dr. Nanba who's suffering from a head cold. The voice is the poorest imitation on the whole cast, and the delivery of a lot of his lines are just downright bad. I mean, I can't imagine the voice director walking away from a line like "Me t'ree, it's a ghost" and thinking that the take is a "keeper." Other than the voices, we get different music (see below) and the return of sensible editing. All the signs are kept as-is, which is refreshing after the ridiculous paint edit in the previous episode. This also the first episode since Johto friggin' Journeys that doesn't have any time cuts. I mean, the idea that a kids' show doesn't need to be edited to shown in the US...why hadn't anyone else thought of that? We also lose the Trainer's Choice commercial bumper, but that's not that big a deal. As for the episode itself? It's a pretty amusing filler episode that is, unfortunately, overshadowed by this whole VA business. While the Sonansu-falls-in-love subplot was unnecessary, it was at least amusing, so I guess there was no harm there. This is also the first time we've seen a lot of these pokemon since Kanto, so it's nice they got some much-needed screentime. The ghost illusion created by the town's ghost-type pokemon keeps its Japanese voice. So in the weeks leading up to the episode's premiere, pro-PUSA fans were going around gloating about a comment made by a PUSA representative "promising" that most of the Japanese music would be kept. And then when we see that we only kept about three pieces of the Japanese music (the title screen theme, a Rocket-Dan song before the presentation of their motto, and the actual motto music), fans started complaining that PUSA had broken their "promise." The thing is, PUSA did say that they were going to keep the Japanese music, but they never said they'd keep all of it. They didn't break any promises at all. The thing is, PUSA promised us nothing, and that's pretty much what we got. We got three pieces of Japanese music (which is slightly less than what 4Kids would give us toward the end of Advanced Battle), but that's it. The rest is a weird amalgamation of 4Kids' old stock music and stuff created by PUSA, and effect is somewhat disjointed. Like one of those hand dryer things you find in a public bathroom, it somehow manages to both work and not work at the same time. Like 4Kids' music, though, I can say that the actual composition of the music is quite good. And hey, you can't be mad at the company for including some scenes with silence, a rarity in made-for-TV dubs. Small, inconsequential things I've decided to point out. First of all, some fans have noticed that everybody's going around calling the ghost-pokemon's illusion a "ghost" instead of what it is; a giant Ghost (Haunter). The thing is, PUSA's wording is consistent with the Japanese version, which uses the word bakemono (ghost, goblin, monster) quite a bit, so it isn't a "mistake" at all. Also, in the Japanese version, the fact that the ghost pokemon use Confuse Ray to create the illusion of the ghost is mentioned twice; once by Nyasu, and again by Takeshi. The dub, however, omits this. May: "But why would the ghost pokémon want to be on the same side as you crooks?" Meowth: "Oh that! It's so sad it breaks my pokémonic little heart!" "Pokémonic?" What the hell does that mean? I really hope this isn't the sign of a return to the days when everyone was adding poké- to the beginning of otherwise dictionary words to create new, pokémon-specific words. That would be poké-nnoying. Also, I wish Meowth's VA would learn how to pronounce the word "pokémon." It's poh-keh-mon, not poh-KEEEeEEeeEeeEeEEEeE-mon. A second is trimmed from the episode's TO BE CONTINUED screen. I'm reluctant to post this edit because the files (that -s is not a typo) of the English version of this episode stops right before the ending theme, so I don't know if the missing second can be blamed on whoever encoded the episode or if PUSA actually made the edit. Either way, it's just a second, so it's no big deal.